"I am happy to address you although I am in prison and no hopes of getting out. We are having rather cold weather here...Well Col I cannot write any news but I would like to know something of Capt. Pierce for I have written to him two letters and have got none from him. I want to know where my valise (bag) is. Capt. Rowan (escaped 2/9/64 from Libby Prison) and Lt. Earle (escaped 2/9/64 from Libby Prison) is well and send the respects also I send mine. There is 9 of my men here in Richmond four in the hospital and ten have been taken to Danville Va...Lt. C H Yates 96th Ills Vol Prisoner of War Libby Prison Richmond Va". 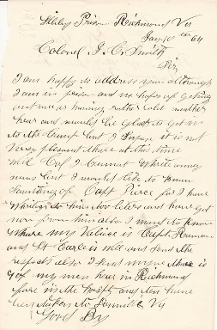 THE OFFICERS MENTIONED IN THE LETTER ARE PART OF THE FAMOUS TUNNEL ESCAPE FROM LIBBY PRISON. It is possible that Yates was part of the group of 109 officers who escaped that day. The database doesn't even show him being in Libby Prison. Further research would be needed.